Gardening is good on so many levels, from the benefits of exercise in the outdoors and the opportunity to share special time with loved ones to having total control over the healthfulness of the vegetables you put on your family’s plates. But gardening can also be frustrating and futile – if you fail to protect your produce from voracious wildlife. No matter how environmentally conscious we strive to be, no one relishes the idea of their lovingly raised produce winding up in the bellies of deer, rabbits, groundhogs, moles, voles and other animals. “Whether your garden is a large backyard plot, a medium-sized raised bed or some simple containers on your balcony or deck, foraging wildlife will be happy to visit and dine there – unless you take steps to urge them to go elsewhere,” says James J. Messina of Messina Wildlife Management. Yet environmental awareness is an essential element of good gardening – and one of the reasons why you decided to grow your own fruits and vegetables. You care about what goes into the environment, so your pest control efforts need to be effective but environmentally friendly. So messy, dangerous chemicals that may put your family, pets and the environment at risk are out for you. The most effective organic pest repellents are those that target the very reasons wildlife love home-grown produce and flowers – taste and smell. Most animals judge the quality of a food source based on taste and smell. Some organic pest repellents, like the 100 percent organic, OMRI-certified products from Messina Wildlife Management, make your produce and flowers taste and smell bad to potential pests, yet are inoffensive to and safe for humans. What’s more, the products won’t harm animals, but will simply convince them to look elsewhere for food based on instinctive taste and scent aversion. They won’t wash off in the rain and only need to be reapplied every 30 days to remain effective. Visit www.messinawildlife.com to learn more. 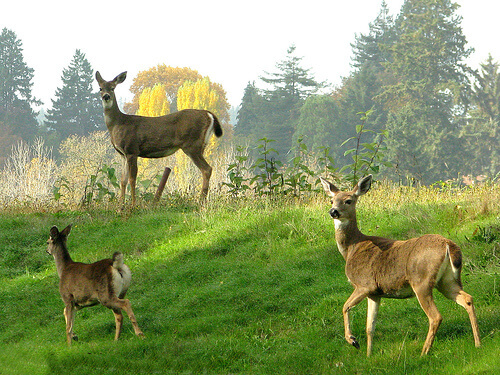 Deer – A single deer can eat about 12 pounds of foliage in a single day. Examine half-eaten plants closely. If the bite marks have a jagged, rough edge they were likely made by deer, whose lack of incisors mean they have to tear at food sources. Rabbits – Bunnies will eat vegetables and even damage woody landscape plants. Rabbit damage is usually no higher than 2 1/2 feet above the ground, with sharp cuts at 45-degree angles on plants. Groundhogs – These burrowers can move a lot of dirt in your backyard. Look for burrow holes with mounds of dirt nearby, and vegetation eaten off at ground level. You may also see gnawing or claw marks on woody vegetation.